Proverbs 19:17 Bible Scripture Tags | Share-IT! | Many Designs! Proverbs 19:17 Bible Scripture Tags – Whoever is generous to the poor lends to the LORD, he will repay him for his deed. 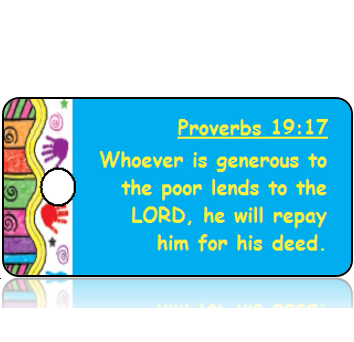 Proverbs 19:17 Bible Scripture Tags (ESV) with a blue background, are a great way to SHARE God’s Word with children. 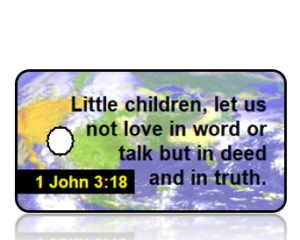 Great for Vacation Bible School (VBS), to help kids memorize Bible Scripture. Use these for your next Scripture Gift Idea or use as a Scripture Verse giveaway! In addition, you can add a personalized message to the back of the Tags, which adds a special touch. Request the same design printed on both sides is also an option. Spread God’s Word by sharing His message with our Proverbs 19:17 Bible Scripture Tags (ESV). 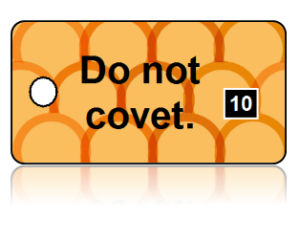 If you do not like this design background there are many more options for you. Switch the background design by choosing from our wide selection. 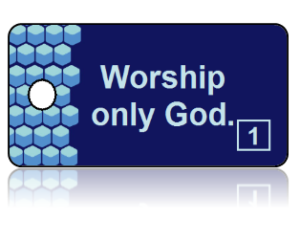 Change the translation for example KJV, ASV, NIV, etc. Change the language for example Spanish, French, German, etc. 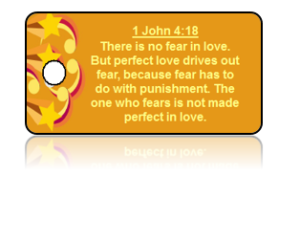 Our hope is Proverbs 19:17 Bible Scripture Tags (ESV) are a blessing to you and to others.